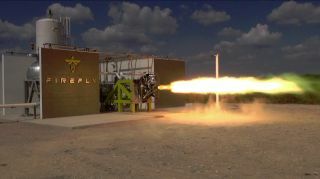 Texas-based Firefly Space Systems, which aims to launch small satellites, has tested its first rocket engine. A company that aims to launch small satellites to orbit has successfully tested its first rocket engine. Texas-based Firefly Space Systems, which is developing rockets dedicated to getting small spacecraft aloft, has conducted a ground test of its Firefly Rocket Engine Research 1 (FRE-R1), company officials announced today (Sept. 10). "The successful testing of our first engine represents a quantum step in the technical maturation of our company," Firefly co-founder and CEO Thomas Markusic said in a statement. "We have demonstrated that our core engine design can reliably start, stop and operate at a steady state without combustion instabilities." FRE-R1 is a pathfinder for the engines that will power Firefly Alpha, a two-stage small-satellite launcher the company is developing. FRE-R1 operates using liquid oxygen and a refined form of kerosene known as RP-1, but the basic engine design can accommodate methane instead of RP-1, if desired, Firefly representatives said. The first stage of Firefly Alpha will incorporate 12 "aerospike" engines arrayed in a ring pattern. Aerospike engines — which are wedge-shaped, without the familiar bell-shaped rocket nozzle — use aerodynamic principles to increase efficiency across the broad range of pressures experienced during flight, Firefly representatives said. "Upcoming engine tests will emphasize performance tuning and longer duration 'mission duty cycle' runs," Firefly representatives wrote in the statement. "The first hot-fire tests of the FRE-2 aerospike engine are expected to take place in early 2016." Tiny satellites are playing a larger and larger role in spaceflight and space science, with some "cubesats" even scheduled to head to Mars, the moon and other deep-space destinations in the next few years. Today, such bantam craft must usually hitch rides on large rockets as secondary payloads, but Firefly hopes to change things by offering a dedicated small-sat launcher that provides efficient and relatively low-cost access to space.